The colors in the photo below have not been altered. This is what it looked like as I stood on the shore of the lake, taking in one of the most beautiful sights of my life. I was surrounded by a heavenly glow of color that was almost too much to take in. Standing there alone for several minutes, I didn’t want to leave the water’s edge. I didn’t want to miss a single second of the beauty that God had placed in motion before me. 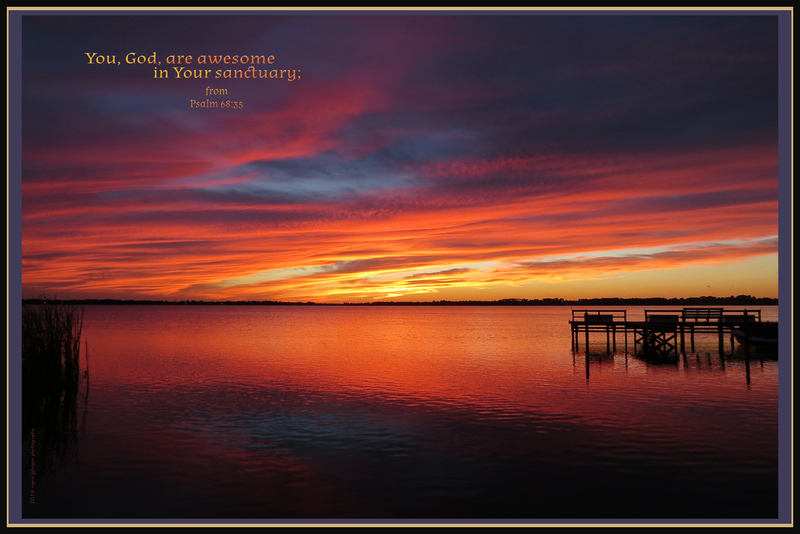 How gorgeous Heaven must be in the presence of our Holy Father and His Son, Jesus Christ! Imagine the glorious colors that will surround the throne! On this earth, He allows us to see such beauty in the skies above us—only a hint of what is to be known in eternity. He had many friends and he invested his life in others tirelessly. A friend and mentor to one of my sons, died at this time of year awhile back. 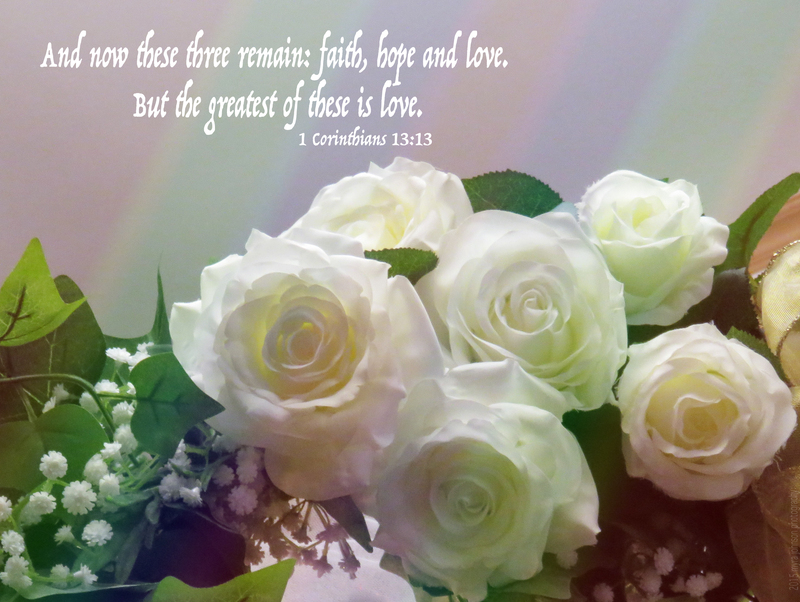 His widow recently purchased flowers for the church sanctuary in his memory. I received a call from the church secretary, telling me that she had asked that I take the flowers home after the Sunday services. Feeling honored, I did just that. 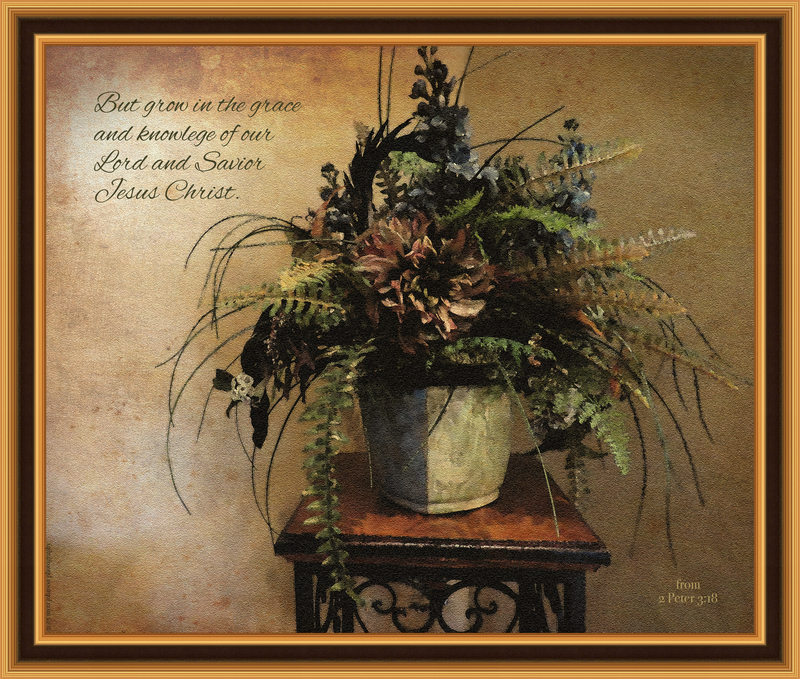 The arrangement was a beautiful addition to my home for many days. When some of the flowers began to wilt, I removed the lively ones and placed them into two different vases. There, they continued to brighten my kitchen for quite some time. Today was a cloudy day, with soft white light filtered from the sun. Deciding to take one of the bouquets outside for a photograph, I placed them on the walkway leading to my front door. My friend’s husband loved the Lord and he loved other people. I believe he is alive today with Jesus. In the Gospel of John, there is the account of a man named Lazarus from a town called Bethany who had two sisters named Mary and Martha. Jesus was close to all three. Lazarus became ill and died, so Jesus traveled to their home to see them. When Martha heard that Jesus was coming, she went out to meet him, but Mary stayed at home. As the passage continues, Jesus tells someone to move the stone from the opening of the tomb. He then calls to Lazarus to come out. Very much alive again, Lazarus obeys! My friend believed in Jesus. Even though he died, he lives. 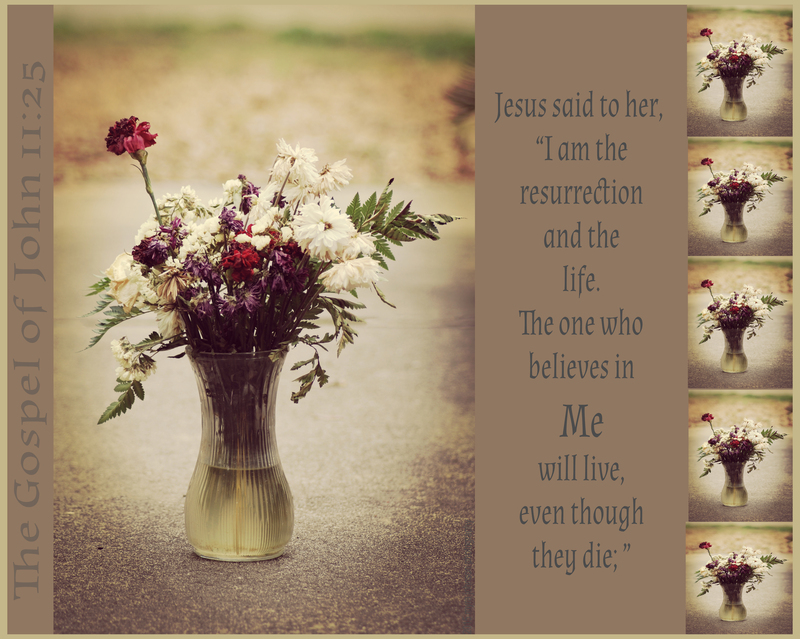 In fact, it’s as though he never really died, because he went immediately from life here to life in Heaven with Jesus. A white rocking chair sits near the old hotel, carefully placed by a stone wall surrounding part of the property. The small flowers growing beside it add a quiet touch of pink to the scene. Even though the setting is inviting, it cannot create a peaceful heart in someone sitting there. The inner awareness that God loves us tremendously brings our souls to experience calm in that deep place within us where His Spirit abides. 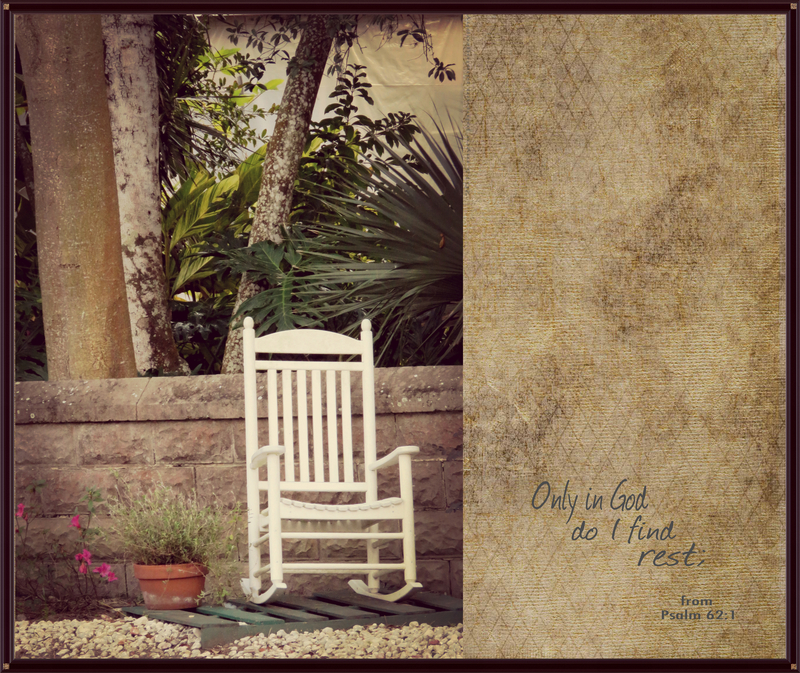 Whether we are sitting in a rocking chair by a stone wall or an airplane seat thousands of feet high, we can know God’s peace. It’s one of my favorite places. The little town borders a quiet lake that often reflects the sunset in vibrant splendor. When I am near the water, I am compelled to look out over its surface, whether it is across the vast expanse of the ocean or the relatively short distance across a lake. I am looking—but for what? I am always expectant, I believe, for something beautiful. My eyes are fixed with bridled excitement at the possibilities of what my gaze should fall upon. Glorious hues of golden sun rays on cotton ball clouds. Sea birds gliding effortlessly on a gentle wind. Sailboats traveling with calm serenity across the horizon. Something good is always there. 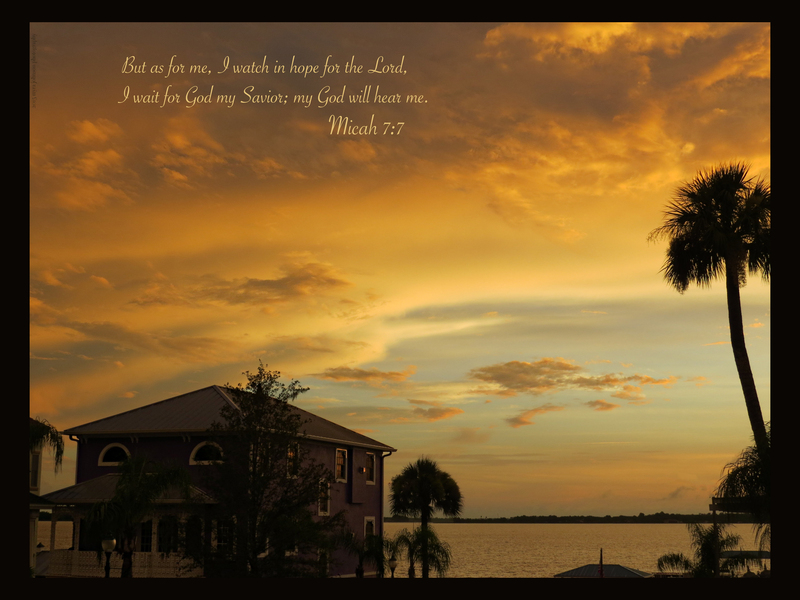 Do our hearts watch, day and night, in hope for the Lord? Watching and hoping, but for what? 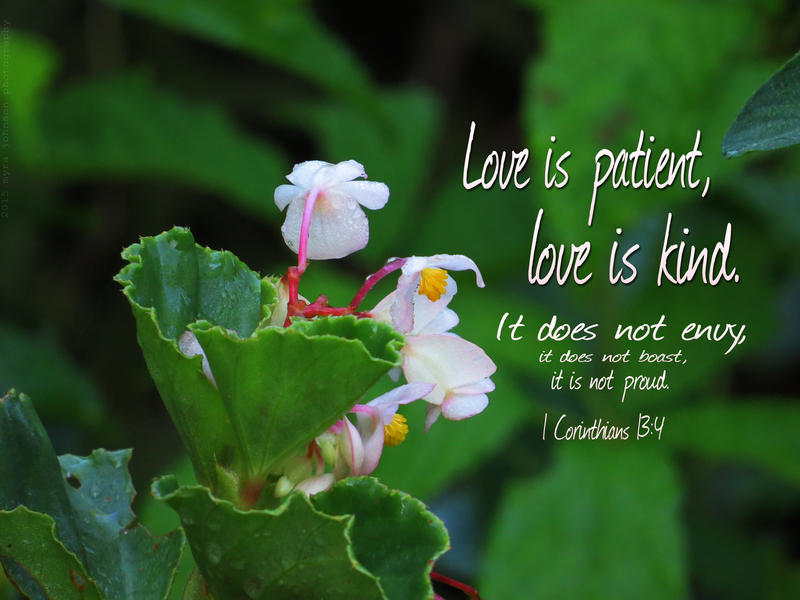 Are we expectant for something beautiful? Are our minds fixed with excitement at the possibilities of what we might see? No matter what is going on in our lives, we can watch in hope for the Lord. It was a very lovely gathering in the outer foyer of the vintage theater. 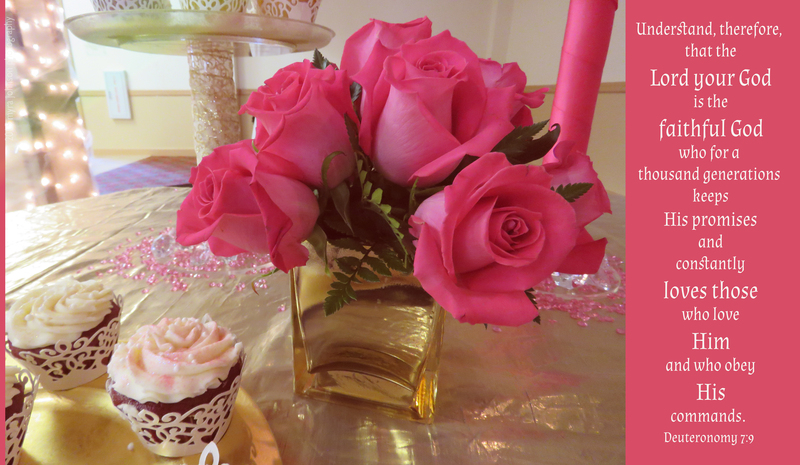 Tables were decorated and food was prepared. 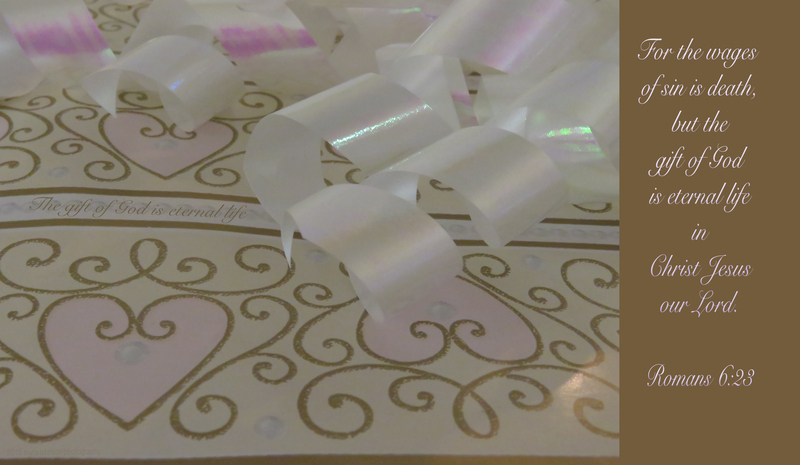 Soft background music floated through the air, adorning the laughter and conversation between family and friends. 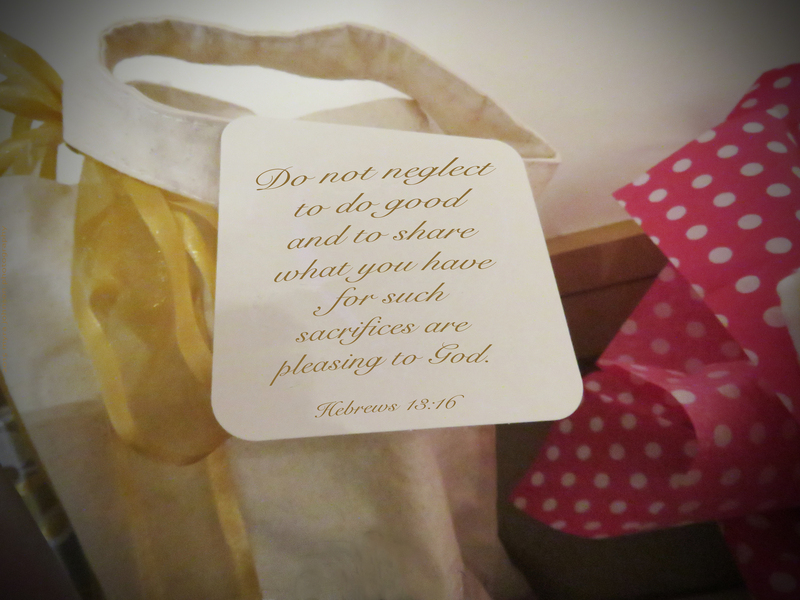 A young lady was being honored at the event and several gifts for her had been placed on one side of the room. The offerings from each guest were varied in size and shape. At least one gift was hand made. When we share with others, we show love. When we give of what we have been given, we show love. God notices when we give to others. When we do good things. These things are pleasing to Him. What gifts have been given to me lately? 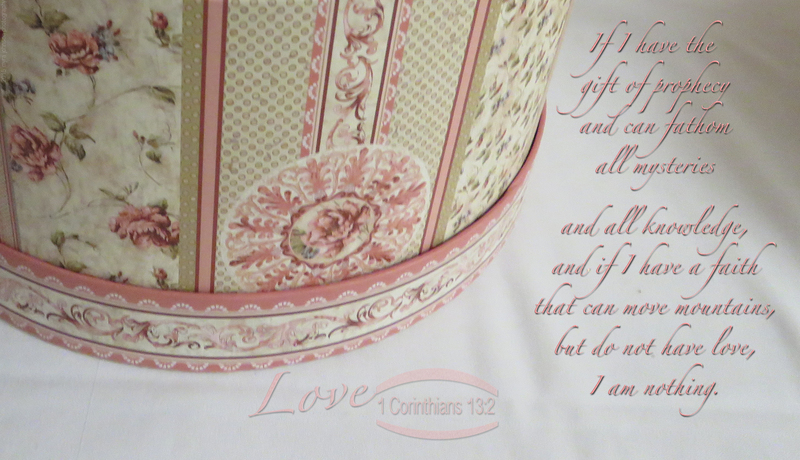 What gifts of time, material items or service has God blessed me with through other people? And finally, what gifts have I given lately? People talking, describing colors, recognizing faces—but you can’t. Family members cooing over newborn babies, laughing over resemblances. Imagine hearing about a sunrise, but only guessing what it could be like. As Jesus was traveling, he came across a man like this. After saying this, he spit on the ground, made some mud with the saliva, and put it on the man’s eyes. “Go,” he told him, “wash in the Pool of Siloam” (this word means “Sent”). So the man went and washed, and came home seeing. 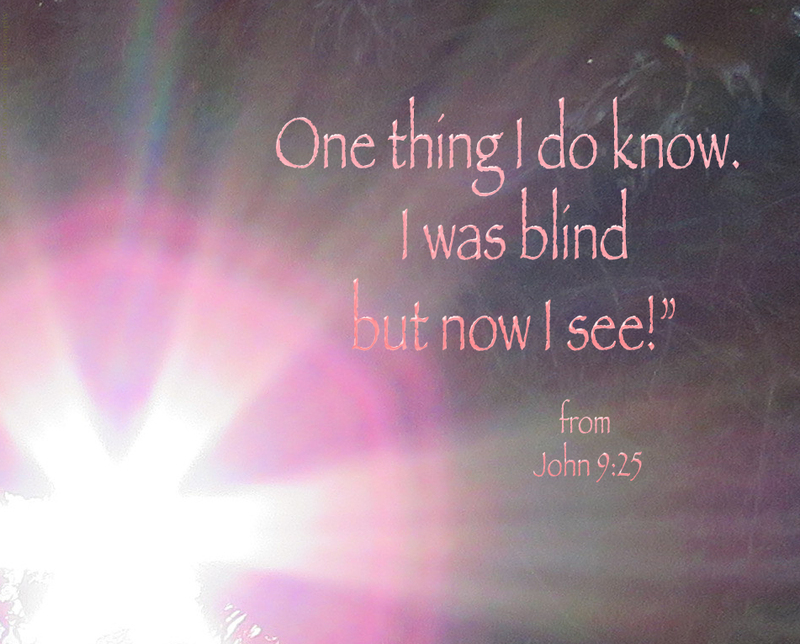 Later, the man who had received his sight met Jesus again. Jesus explained to him that He was the Son of Man. At that time, he believed in Him and worshiped Him. Do you suppose that anyone ever, the rest of his life, could have convinced this man that Jesus was not who He said He was? His eyes had been opened! And not only his physical eyes, but his spiritual eyes, as well. It’s not too late for our spiritual eyes to be opened. 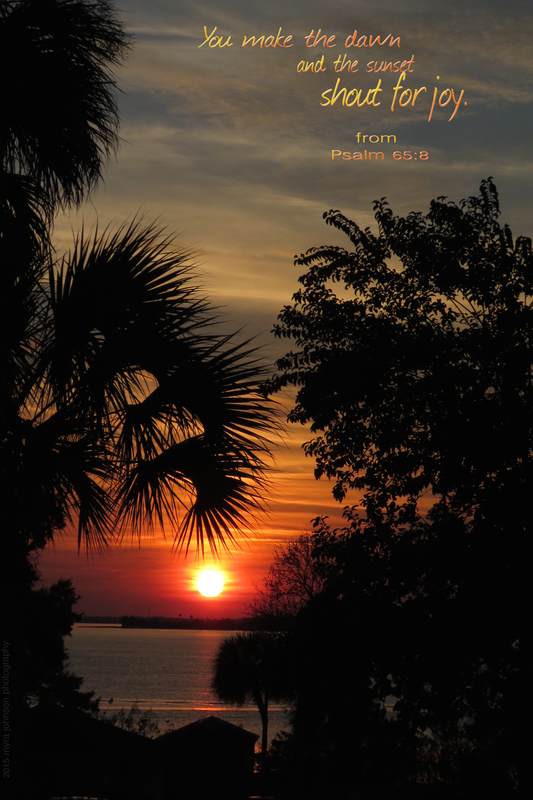 If you do not know Jesus as your Savior, let today be the day that you receive your sight…. I have a friend who has a restful looking hammock in her backyard. Is it possible to look at a hammock and not think about resting? When we come in from a long day at work and we are finally able to lie down, a sweet feeling of relief ensues. Many people cannot find emotional and spiritual rest. Tired and weary of pain from the past. Weighed down by shame and guilt. Looking this way and that, could there be a way to rest? 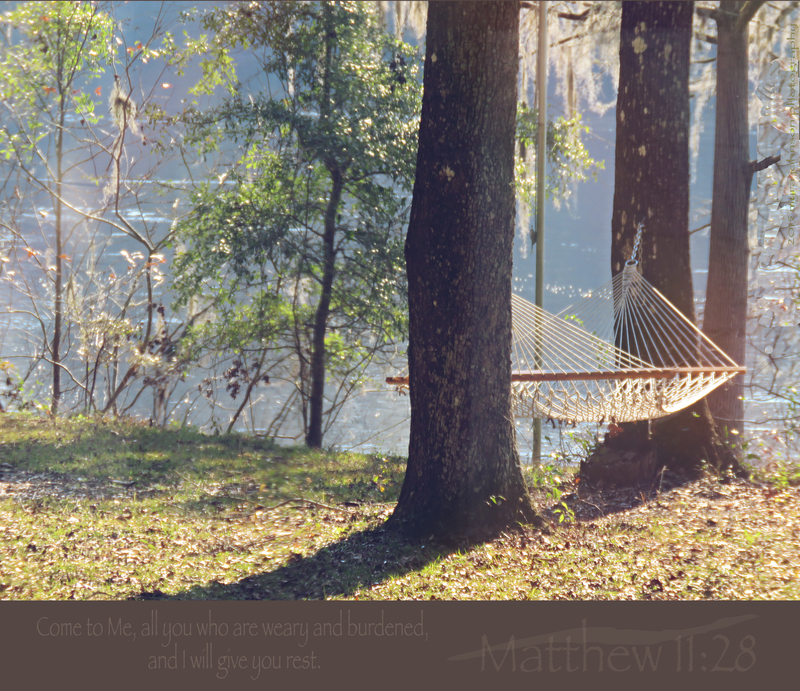 Jesus says He will give us rest. He says that He will give us rest for our souls. He is the only answer to the burdens that we carry. It was a very captivating nature movie, showcasing the lives of a mother bear and her two cubs. To be honest, I didn’t want to miss a thing as I looked intently at each scene. Drawing a deeper meaning than what was actually on the screen, a particular part of the movie really made an impression. The movie was narrated, but the “acting” wasn’t acting at all, since it was just the filming of bears in the wild. The narrator simply explained some of what was happening, adding comments of interest. At one point, the mother bear and two very small cubs were walking together. The narrator points out that a predator has come onto the scene. A stealthy wolf is walking slowing with a determined gait, his eyes locked onto the cubs. He means them total harm, without apology. The camera zooms in on his cold, hard gaze as he continues to move forward with undaunted resolve. Zooming out, the viewers see the mother bear and cubs walking along, unaware of the danger immediately behind them. What was it that I was seeing in all this? I realized that the bears were like people. We can be looking ahead, unaware of the danger, as Satan lurks quietly behind us, with a resolute intent to harm. As the wolf’s lean legs planted each step with purpose, I could picture the Enemy moving forward, silent and vicious, waiting to attack you and me. We are definitely just tiny cubs in this world. Yet, we need not fear. As we walk along, Jesus is with us. He is aware of the “wolf” following behind. He warns us of the “wolf’s” presence. He will not leave our side. Jesus speaks of us in the Bible as being His sheep. 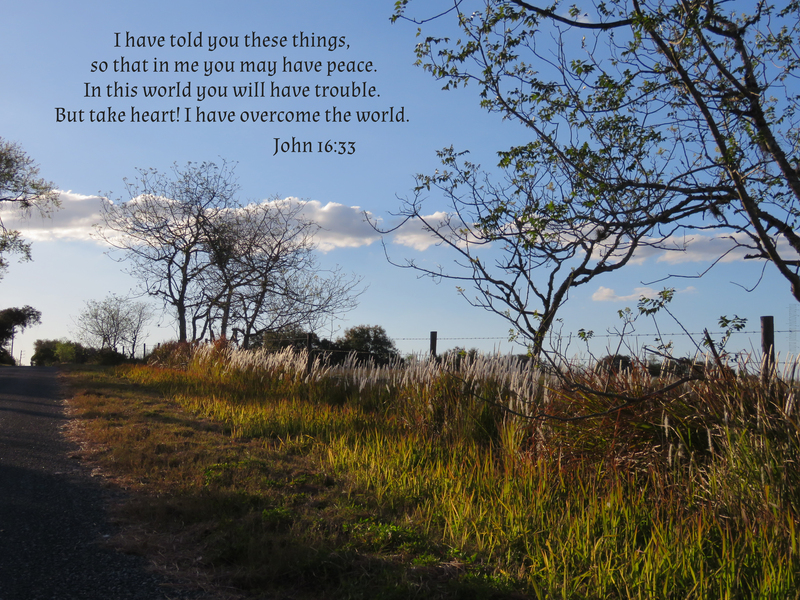 Therefore Jesus said again, “Very truly I tell you, I am the gate for the sheep. All who have come before me are thieves and robbers, but the sheep have not listened to them. I am the gate; whoever enters through me will be saved. They will come in and go out, and find pasture. When the Enemy lurks behind us, we are not alone. Once this had transpired, Jesus made His way to the other side of the Sea of Galilee (which some these days call the Sea of Tiberias). As Jesus walked, a large crowd pursued Him hoping to see new signs and miracles; His healings of the sick and lame were garnering great attention. Jesus went up a mountain and found a place to sit down and teach. His disciples gathered around. The celebration of the Passover, one of the principal Jewish feasts, would take place soon. But when Jesus looked up, He could see an immense crowd coming toward Him. Jesus approached Philip. Jesus (to Philip): Where is a place to buy bread so these people may eat? Jesus knew what He was planning to do, but He asked Philip nonetheless. He had something to teach, and it started with a test. Reading on, I found that Philip thought that even half a year’s wages wouldn’t be enough to buy bread to feed the crowd. Another of Jesus’ disciples, Andrew, had seen a boy in the crowd who had five barley loaves and two fish. When Jesus took this food and gave thanks to God for it, all the people were able to eat all they wanted. The disciples gathered twelve baskets full of left overs. As I was reading this passage, a verse resonated in my mind. He had something to teach, and it started with a test. 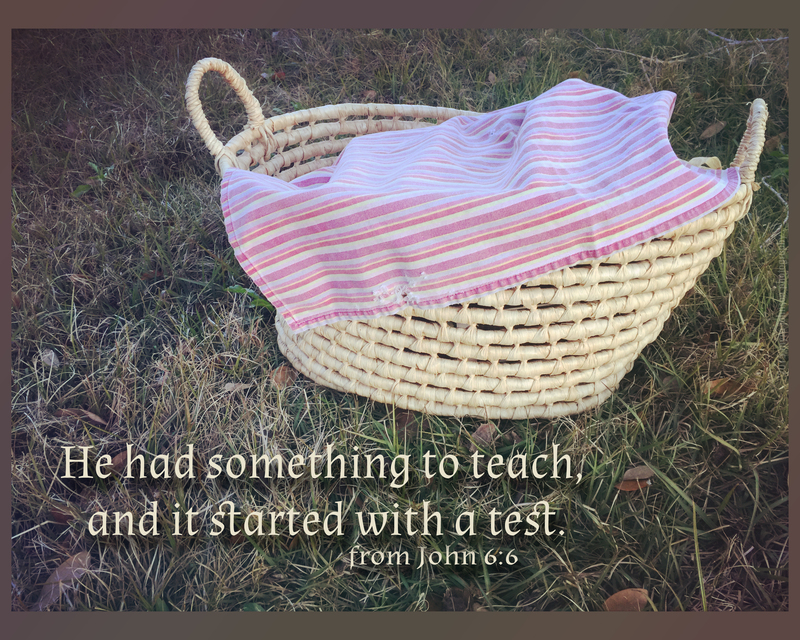 Does Jesus sometimes begin our lessons—yours and mine—-with a test? If all of life is a test, and a test both develops and reveals our character AND establishes our quality, performance and reliability, what, oh what, are we as mere humans to do? Doesn’t it all sound incredibly overwhelming? If we had to memorize all the answers to every test in life, we wouldn’t be able to do it. Instead, our life tests are “open book” tests. We have the Bible to guide us as the Holy Spirit leads and we have prayer as an avenue to find the correct action in every circumstance. Will we always look for God’s guidance in our test? Yet, we are developing; growing closer to Him, coming to know Him better. God has life lessons to teach us throughout our days on earth. Are we eager to learn? When they were still very far off, I spotted them. The flock of white ibis were headed my way and I wanted to photograph them as they came near. Graceful and silent, they flew by, the evening sun giving some of their feathers an orange glow. When we discover God’s great love and forgiveness, we are offered freedom. Freedom to fly away from our old way of life. 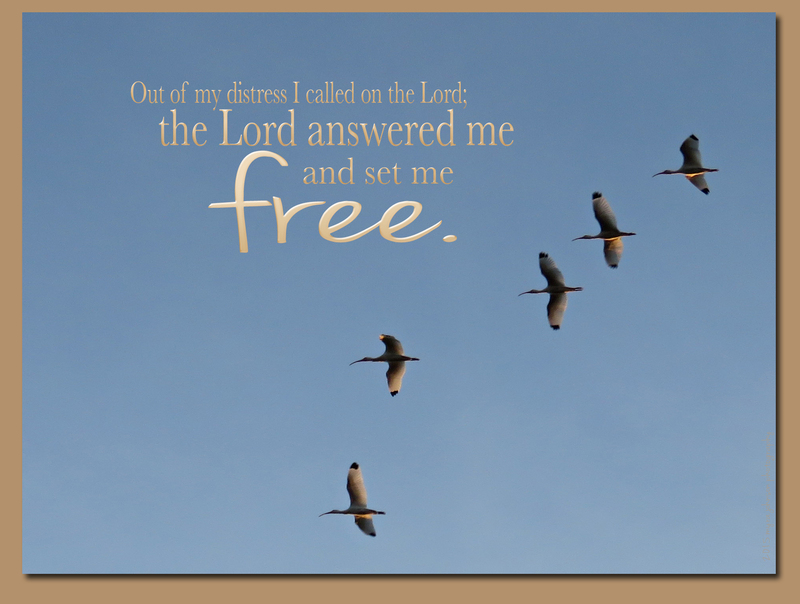 Freedom to soar without guilt or condemnation. It’s an old concrete wall. Sitting near a street corner, it is moldy and weathered looking. Oddly enough, there are crevices in the stone where plants have begun to grow. No gardener planted them there. In a way, it’s like God put them there to sprout. Even though it’s an unusual place to be, the plants are green and vibrant looking. Sometimes, we may feel like we are in the wrong place. We’d rather be somewhere else. 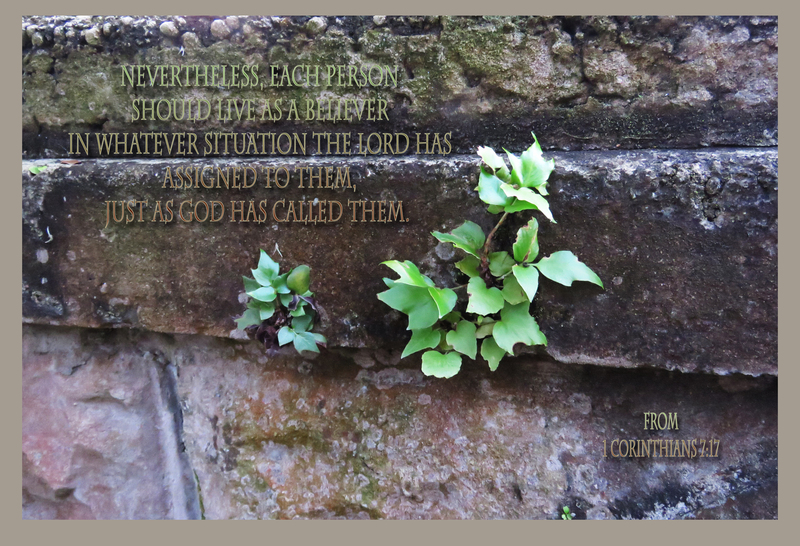 Surely, God wouldn’t want us to bloom in the crack of an old wall! Wherever we are, we should be who we are as God’s people in that place. The sun was going down as I walked with my husband in the quiet little town. We had been looking at birds overhead and at birds in the water. The colors in the sky were in constant visual motion, changing hue with each passing moment. God was creating the once-in-a-lifetime scene, and we were witnesses to see its beauty. Sometimes, life lessons just show up—like in my kitchen. Yesterday, I decided to make waffles for breakfast. If you’re going to have waffles, butter and syrup have to be on the menu, as well. When the meal was over, I put away the ingredients I had used. Ready for the day, I left the house and did not return until fairly late at night. 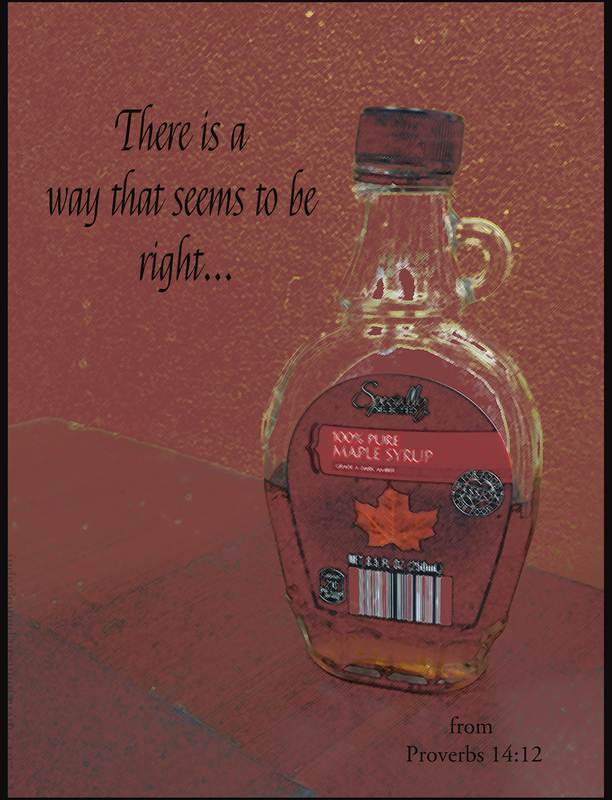 The next morning, I saw that I had left the maple syrup on the stove with the cap on, but not tightened. Upon closer inspection, I realized it was filled with ants. Probably more than a hundred ants. A scout ant had found the “gold mine” of the century and had alerted all his co-workers of the his sweet discovery. Ant after ant had decided to take the trip down the bottle to sample the gooey, brown lusciousness of endless syrup. Ant after ant became trapped and unable to crawl out of the bottle. If they had only come upon a small drop or two spilled on a counter, they would not have met with their demise. If they had only been satisfied with the small residue on the cap of the bottle, they most likely would have survived. The inside of the bottle looked too good. 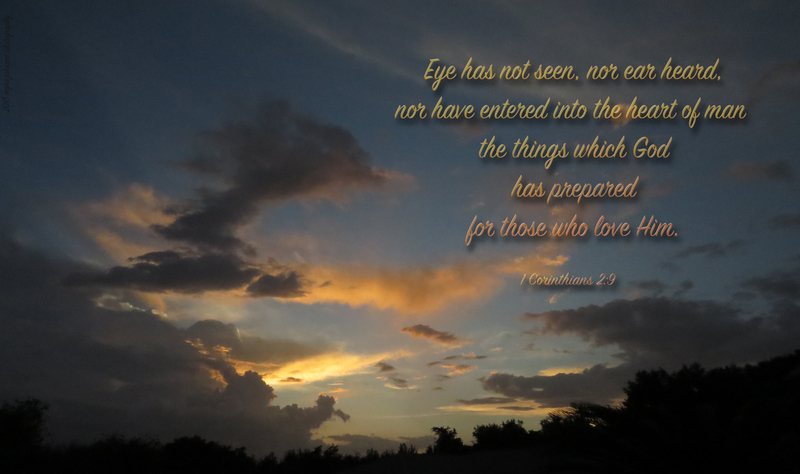 Right there, in my kitchen, this verse was illustrated perfectly. The ants thought going into the bottle of syrup was right. If we are wise, we will ask for God’s leading and guidance before heading into any situation, even if it seems right at first. If He tells us to pass on the syrup, then that’s what we had better do. He constantly loves His children. I noticed her, high up in a tree by the water’s edge. She was sitting on a nest so far above the ground and on such spindly looking branches. The nest was of her own creation, done just the way God had placed into her mind to do. Protecting her offspring was also placed into her mind, as well, I believe. 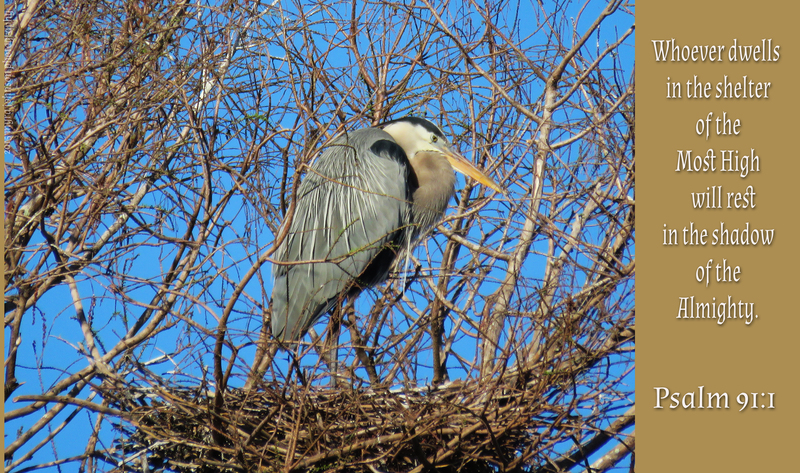 The Great Blue Heron, far up in the branches, will continue to watch over her young to keep them from harm. In reality, aren’t we like a tiny, helpless bird in a treetop nest? Unable to protect ourselves from the vast unknown? If we are found in the shelter of God, we can rest in His shadow and in His love. It was lunchtime, so I stopped at a familiar grocery store that sells pre-made salads in their produce section. When I began to peruse the selections, I was disappointed. There is a particular salad from there that I prefer. Walnuts, raisins, apples and blueberries on a bed of fresh spinach leaves. Looking carefully at the display of salads, I didn’t see my favorite. A man was working behind me in the produce area. I explained that I wasn’t finding what I wanted and I asked if he could look “in the back” to see if there were any that had not been put out for sale. He looked, and none could be found. He stopped what he was doing, went behind the counter and began making a salad to my specifications. He even went out into the store and got a box of raisins and a package of walnuts when he realized he didn’t have any. While I was waiting—at two separate times—someone who worked at the store saw me and asked if I needed any help. Also, as I watched him making the salad, I overheard him interact with two other employees who were apparently under his authority, in a very kind and considerate manner. After quite a bit of trouble on his part, he happily handed me my salad in a clear plastic container. To top things off, he apologized to me for the wait…. When I got home, I was pleased to see that I not only had walnuts, apples, raisins and blueberries, but I had strawberries and raspberries, too! This man not only represented his employer well, he represented himself well. What would it be like if we represented Jesus to others? When someone asks us for help, what if we were to stop what we were doing in order to see to their needs? What would happen if we went out of our way to do what was best, even if it took longer? 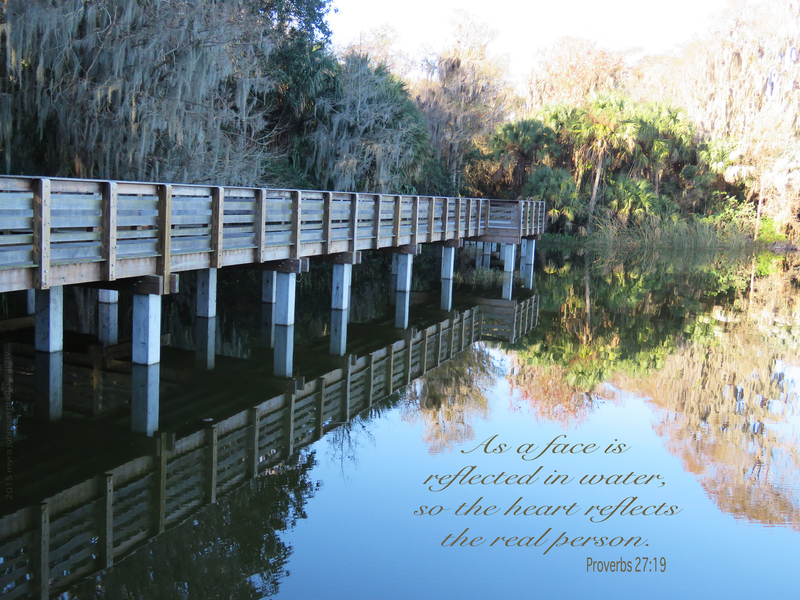 What if we showed Christ-like character in our interactions with others while we were helping? What if, while we were helping, two other Christians came by and offered their assistance? 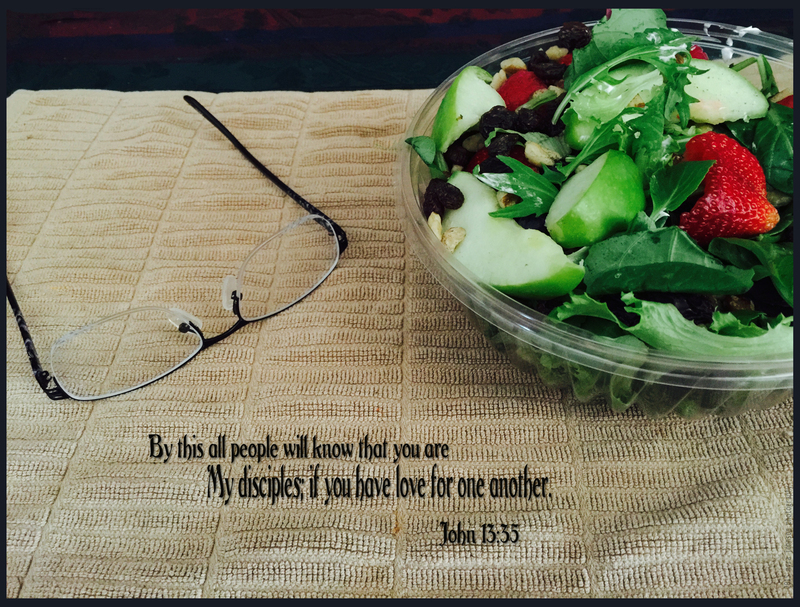 I went away from the store marveling at the attitude and character of the man who made my salad. The whole experience makes me look forward to visiting that store again. If there are those who don’t know Jesus as their Savior who are within our scope of care and influence at any time, would their experience with you and me make them look forward to seeing us again? Would they want to know more about becoming a Christian after realizing that we were? The boardwalk was quiet for the most part. I passed a couple of people fishing off the rail. Silent birds gliding through the still, moist air made their way across the wide expanse of the water. The lake before me was like a perfect mirror, reflecting the perfect beauty all around. We give gifts at Christmas. We give gifts on birthdays. We give gifts at Valentine’s Day. We give gifts to show love. The one who receives the gift then has something that they hadn’t before. God did not want us to be lost forever without Him. He didn’t want us to be separated from Him. He sent His Son, Jesus, to pay the penalty for our sins. Then, He offered us the gift of eternal life. 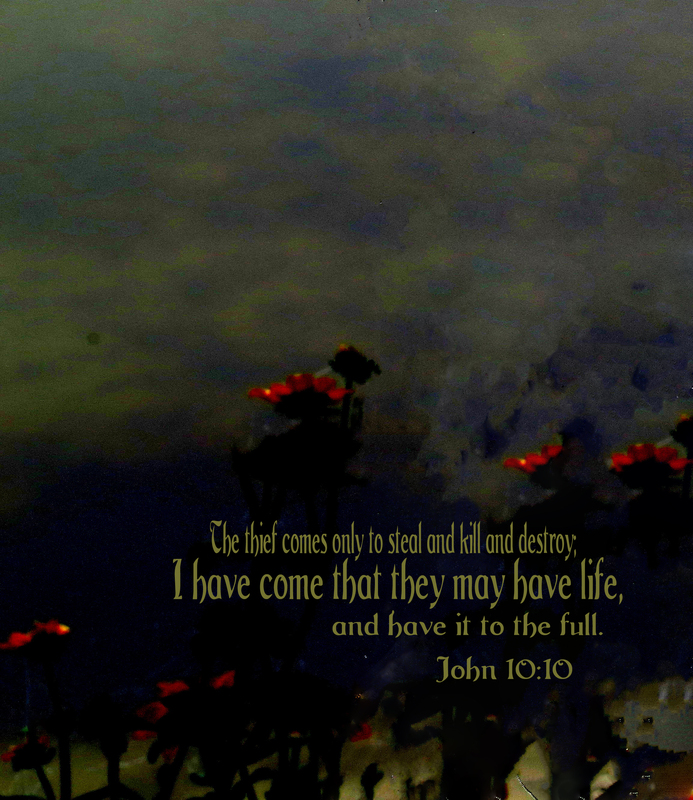 We did not have eternal life before. There was no possible way for us to get it for ourselves. The gift must be accepted. Do you feel weary today? Are you stumbling, feeling like you’ve fallen too far to get back up? There is hope for you, for me and for all of us. That hope is in the Lord. I photographed an eagle yesterday. The wingspan was wide and powerful looking. 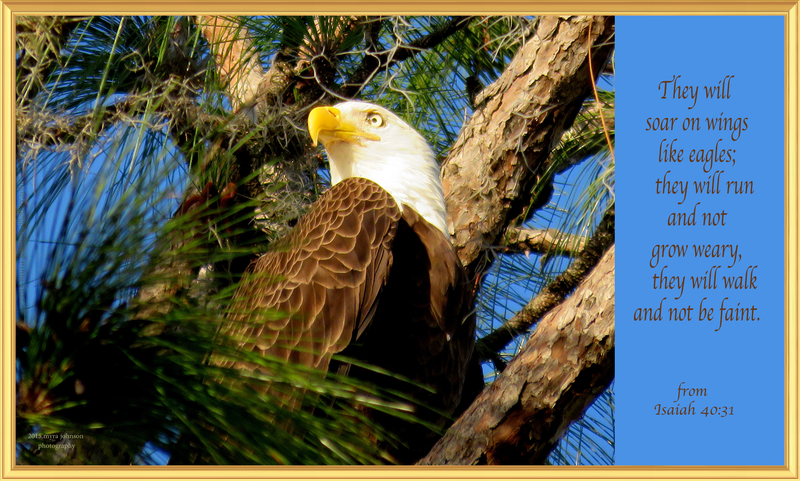 If we hope in the Lord, the Bible tells us we will renew our strength and we will soar on wings like eagles. The afternoon breeze had the slightest chill as I sat in my lawn chair, hoping to get a photograph of a bird in a nearby nest. Venturing out into the country, away from loud noises and constant distractions, it was nice just to think quietly and breathe in the fresh air. After awhile, a woman came along, aware of the nest, high in the trees. Then, a man driving a truck with a horse trailer hitched on the back came driving up the dirt road. Getting out, he explained that he was looking for a cemetery for a graveside service. He was bringing the horse to the ceremony. The woman I had just met was from the area and able to tell him where to go. He told us the funeral was for a child—only three years old. I didn’t ask why he was taking a horse there. Was the horse the family’s animal? Did the child love horses? I hurt for the family, knowing their pain and grief surely must be great. There was nothing I could do to ease the sorrow of the moment. Only God could meet that family in the deep places of their hearts with comfort, understanding and love. As I left to go home, I photographed the road and the field beyond. It was peaceful and quiet—serene. We can trust in the Lord always. 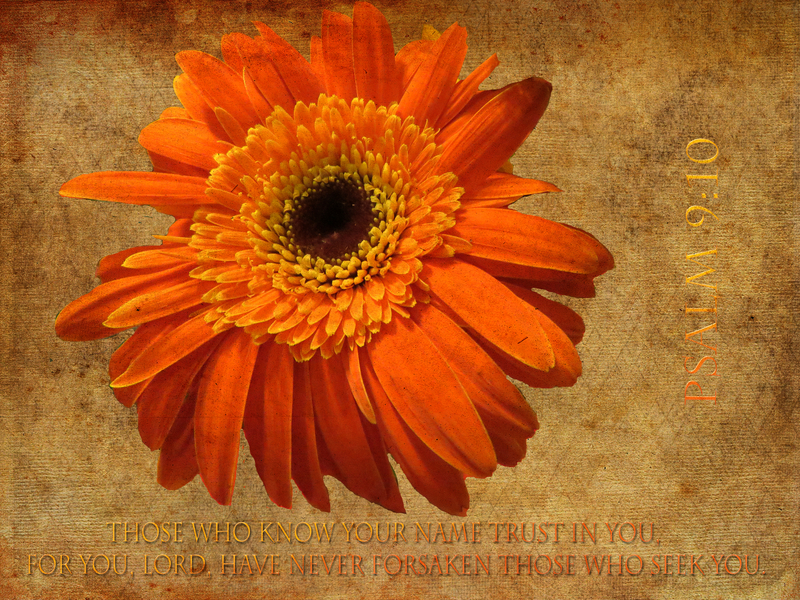 We can trust Him in all ways. Or am I envious, boastful and proud? Or am I self-seeking and easily angered? Do I keep a record of wrongs? Do I delight in evil or do I rejoice in the truth? How many times have I heard this recording or something similar after dialing the number of a business? It doesn’t really matter what business it is anymore; you could be calling your doctor, the electric company or a fabric store. And how do they propose to achieve assurance of it by recording your conversation? I have my own thoughts about the answer to that question, but the whole idea brings up a different, parallel thought. Would that have any effect on what words you chose to say? How about the tone of voice you used to say them with? If someone could actually play back your conversation, would you think twice about your role in the exchange? The truth is, your conversations ARE being recorded. Not exactly by an electronic source, but recorded, none the less. First of all, God hears every word. He remembers everything, so He will always know what you have said. Secondly, the people you are talking to at any moment often remember the words that you are saying to them, even when you may forget. Thirdly, if even for a short time, you are recording in your own mind what escapes from your mouth. Five minutes later or the next day, week or year, you may still be very aware of your part in a past conversation. 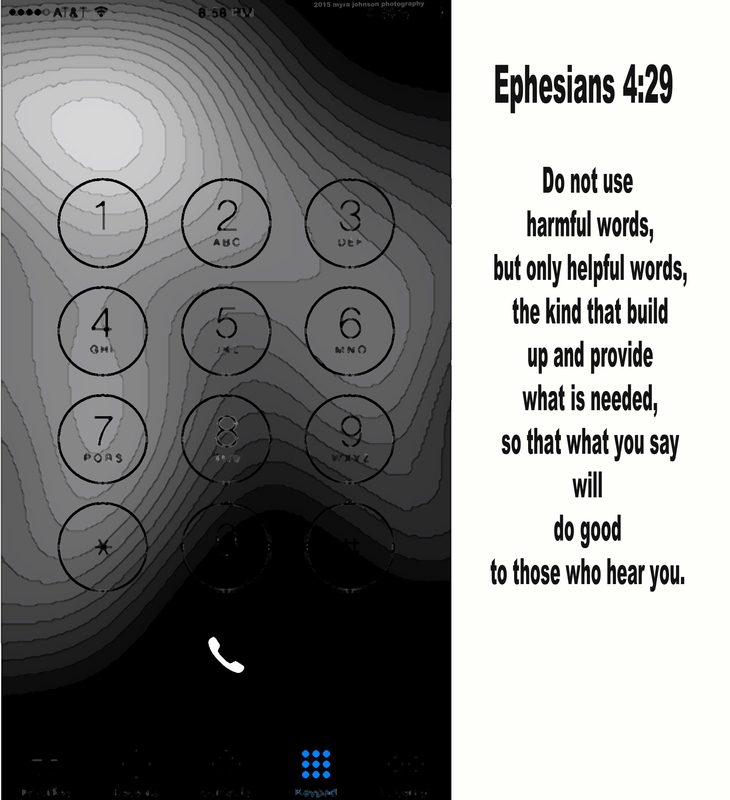 not just for quality assurance, but to please God. Do not use harmful words, but only helpful words, the kind that build up and provide what is needed, so that what you say will do good to those who hear you.